This size is a popular choice for an average sized cruising yacht. It is spacious enough to carry 4 to 5 adults with additional gear. 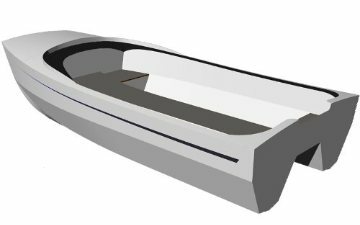 This model is suited to davit storage but is light and small enough to drag or carry if required. The extra length provides more relative comfort in any chop or rough conditions. Performance is excellent under power whether on the plane or at slow speeds. This design also makes a capable and safe vessel for day trips away. Select from a DuFlex Foam, DuFlex Balsa, Plain Foam or Gaboon Plywood kit with plans, or purchase the plans only. Kit Prices are provided on request, please contact our office. Cad-drawn colour construction plans are supplied in an A3 sized booklet of high detail specifically suited to amateur building. Plans are provided in printed format only. To read more on design and kit inclusions, please visit the Designs page. All information given is based on design parameters and can vary depending on the conditions experienced and also the build accuracy. Plan only option includes postage. Shipping for Kit purchases is quoted separately as prices vary depending on destination. Please contact our office. Prices below are inclusive of GST. The GST component will be removed for international customers. Disclaimer Copyright © 2013 Spirited Designs. All Rights Reserved.